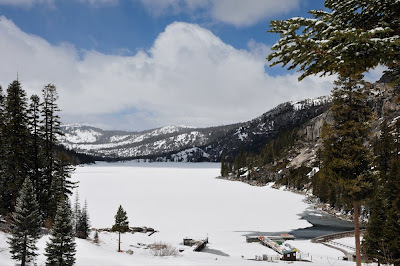 Given the recent cold spells and the 2" of fresh snow that fell overnight, it wasn't too surprising that I could ski all the way to the Echo Lake Chalet, despite being May 23rd. The fresh coat of snow kept the lake looking so fresh and so clean. Will it still be frozen for Memorial Day? My guess is Mother Nature won't be melting it, though the Chalet has been known to take matters into their own hands.